Since the police killings of 34 striking mine workers in August 2012, British-South African mining firm, Lonmin, has failed to live up to many of its social commitments to the workers and the survivors of the deadly attack. Join South African Bishop Johannes Seoka outside the Lonmin AGM to demand accountability from the company and its investors. What? 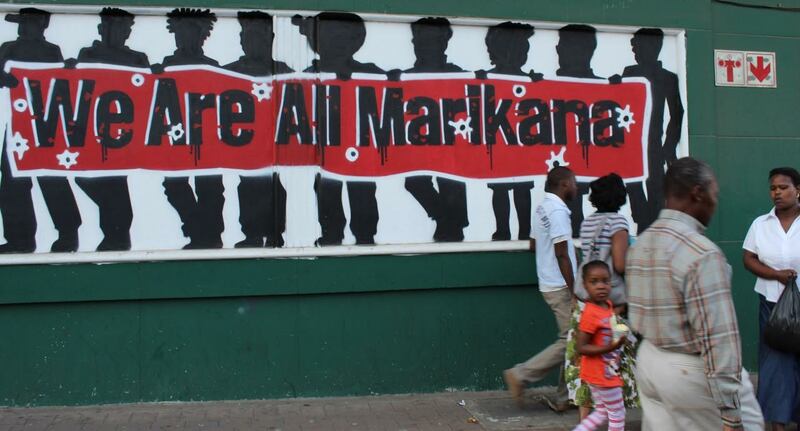 A commemoration of the lives of the 34 miners killed at Lonmin’s Marikana mine on 16 August 2012. Wear all-black if possible. Who? Bishop Johannes Seoka is a Right Reverend of the Anglican Church, retired Bishop of Pretoria and chairperson of the Bench Marks Foundation, as well as an official representative of the Lonmin mine workers. He is travelling from South Africa to present the workers’ demands at the Lonmin AGM. Bishop Seoka is supported by: Marikana Miners Solidarity Group, Plough Back the Fruits, London Mining Network and the Bench Marks Foundation. On August 16, 2012, 34 miners from the Lonmin platinum mine in Marikana were shot and killed by the South African police during strike action. The miners were on strike due to low pay and inhumane working and living conditions. While the killings were carried out by the police, according to the Farlam Commission report, significant responsibility for the massacre also lies with Lonmin for failing to adequately negotiate with workers, or to protect its employees during the dispute. In December 2016, South Africa´s President Jacob Zuma made an announcement that the government is ready to pay compensation to the victims of the 2012 Marikana tragedy. On January 23, representatives of the Campaign network “Plough Back the Fruits” will come to London. Collaborating with the London Mining Network they will participate in the Lonmin AGM (January 26) and meet investors in the mining industry, e.g. Church Investment Group (CIG), Ethical Investment Advisory Group (EIAG) of the Church of England and Share Action. The Bench Marks Foundation has proposed that Lonmin address the squalid living conditions in informal settlements where their workers live, by ensuring proper drinking water, sewage disposal and electricity in the immediate term, as they work to address affordable subsidised rental accommodation. This is particularly pertinent given it is the mine’s heavy water usage that deprives the informal settlements of their basic water needs. Lonmin have employed many of the widows and offered school support for the children of the murdered miners. Both of these measures are entirely inadequate and perpetuate the suffering, as widows have accepted these jobs to survive, but want Lonmin to compensate them for their losses. Compensate the victims of the massacre to allow the widows, orphans and injured survivors a dignified existence, with payments in the region of 20 years’ wages that workers would have earned had they not been killed or critically injured exercising their right to organise. Bishop Seoka will be calling on investors at the Lonmin AGM to take a resolution to compel the company to address the above demands and to set a time limit of August 16th 2017 (five years since the massacre) to comply. Should this not happen, Bench Marks Foundation will call for international solidarity to have Lonmin’s mining license revoked, as per President Jacob Zuma‘s statement in December 2016. Written in collaboration with Jo Seoka, retired Bishop of Pretoria and Markus Dufner, Ethical Shareholders Germany. Below is a short German documentary looking at BASF, one of Lonmin’s biggest customers, and the efforts to create accountability throughout the platinum supply chain that flows from Marikana. Panorama_subbed from plaintextproduction on Vimeo.